NEW YORK, NY — On Sunday, 18 March 2012, two delegates of the Philippine Universal Periodic Review (UPR) Watch conducted a sharing with community members on the fourth leg of their international speaking tour. 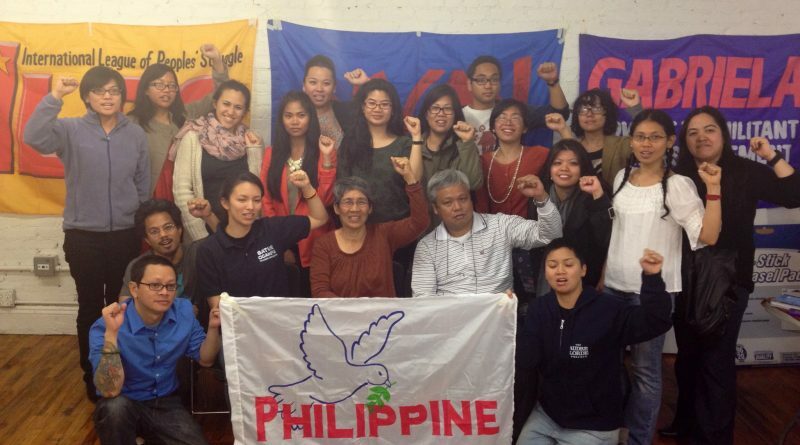 The event, called “Voices of Resistance”, was hosted by BAYAN USA organizations in the North East region and featured Bishop Reuel Marigza and Angie Ipong. The speakers described their personal experiences with state-sanctioned human rights violations and the climate of impunity in the Philippines. The contingent of the Philippine UPR Watch was in New York City to speak at the United Nations in an effort to call attention to the grave human rights violations perpetrated by the Philippine government. Bishop Reuel Marigza, the General Secretary of the United Church of Christ in the Philippines (UCCP), urged the community members to ask their United States representatives and State Department to stop funneling military aid to the Philippines. US military aid to the Philippines funds the Armed Forces of the Philippines (AFP) to conduct counter-insurgency missions modeled after those of the US. Unarmed activist groups have been labeled by the Philippine government as fronts of the Communist Party of Philippines (CPP) and its armed wing, the New People’s Army (NPA). Therefore, they face high threats of state violence. Because of their vehement criticism of the Philippine government’s human rights record, as well as their anti-people legislation and policies, the UCCP is the most targeted faith-based organization for extra-judicial killings, enforced disappearances, torture, harassment, and various other types of human rights violations. Bishop Marigza is at the forefront of the effort to file civil cases against the former President Gloria Macapagal-Arroyo, on behalf of the victims and their families. Under Arroyo’s 9-year term, over 1,188 activists were killed and over 205 were forcibly disappeared. Angie Ipong, formally known as the oldest female political prisoner in the Philippines until her release in 2011, recounted her experience as a political detainee for 6 years. Having grown up in a peasant family, she has dedicated her life to defending the rights and welfare of peasant farmers, who make up 75% of the country’s population. Peasants face landlessness, usury, and unfair working conditions. Ipong organized peasants by holding educational discussions to inform them of their political rights, and mobilized protests related to their issues, targeting landlords and the Philippine government. In 2005, she was charged and arrested with two counts of rebellion and several other trumped-up charges including murder, attempted murder, and arson. Trumped-up charges, according to Ipong, purposely prolong the detention of activists. Ipong said, “I never expected the protectors of our law could do such a thing,” as she vividly described her horrific experience with various types of physical torture, sexual molestation, being forced to be incommunicado. She is now a consultant for the National Democratic Front of the Philippines (NDFP), which has been insisting on resolving the socio-economic roots of the armed conflict through peace negotiations with the Philippine government. Included in these negotiations are provisions for genuine agrarian reform, which would equally and fairly redistribute land to peasant farmers and end centuries of feudal exploitation in the country. In 2008, Philip Alston, the UN Special Rapporteur on extrajudicial, summary, and arbitrary executions, conducted a thorough report of the Philippines and exposed its poor human rights situation. This year, the Philippines will be facing another official review by the United Nations. The New York leg of the Philippine UPR Watch Speaking Tour concluded at the UN Church Center on Monday with a public forum on the human rights situation of the Philippines. Ipong and Bishop Marigza, along with Bishop Felixberto Calang, of the Iglesia Filipina Independiente and another member of their delegation, want to remind the world that conditions have not changed under the new regime of President Benigno “NoyNoy” Aquino. They hope to hold the Philippine government accountable for their worsening human rights record and urge the international community to support their call for justice.